Tad McCall was a young man when his father, former Oregon Governor Tom McCall, swooped onto Cannon Beach by helicopter to lobby for the Oregon Beach Bill on May 13, 1967. Tad McCall didn’t know then that his father would change the course of history. A motel owner in Cannon Beach had closed off part of the beach, and a quiet fight was underway in the Oregon legislature between developers and conservation-minded lawmakers. Both sides wanted the rights to control the dry-sand portion of the beach, where we now build sandcastles, fly kites and take long beach walks to our heart’s content. 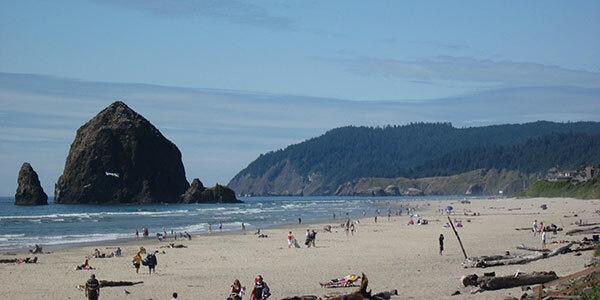 But the proposed Beach Bill — which maintains public access to all 363 miles of Oregon coastline — had been stalled in the legislature, since the public hadn’t heard of it. That was, until newly elected Governor Tom McCall stepped on the beach and drew a line in the sand. Thousands showed up at the state Capitol to rally for the bill, and McCall signed it into law two months later (July 6, 1967). Tad McCall grew up fishing and enjoying the natural spaces in Oregon, and inherited his father’s conservation ethos. He’s a retired U.S. Navy captain, has done work to oversee the U.S. Air Force environmental program and has served at the U.S. Environmental Protection Agency. Currently he supports the U.S. Department of Defense in its work protecting endangered species while safeguarding national security with the Texas A&M Natural Resources Institute.